When this recording was conceived, my desire was to show the versatility of the Fisk organ in St. Paul’s, Greenville, The Perkins & Wells Memorial Organ. Such is the personality of the organ that it is affectionately known as “The Duchess.” While this album certainly makes a generous bow to the French Symphonic “DNA” of this organ, it also affords listeners an opportunity to enjoy the instrument’s ability to interpret a wide variety of literature. The Tuba mirabilis of Opus 126 is singularly exciting among such stops that I have heard anywhere in the United States; it is showcased in John Cook’s Fanfare. Thanks to the expressive lyricism of Opus 126’s color stops, such as the amply voiced flute cornet combination on the Positiv division and the various reeds on each division, even the classical French literature succeeds brilliantly here. It is my hope that you will find “The Duchess” to be as dazzling an organ as do I. 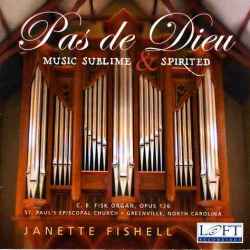 On this first recording of the "French symphonic" Fisk organ, Opus 126, Janette Fishell plays a brilliant program that includes the world premiere of Ferko's Livre d'orgue. A superb acoustic also enhances stunning performances of the rarely heard Litaize and Duruflé's masterpiece on "Veni Creator." Frank Ferko: Livre d'orgue - World premiere recording! Gaston Litaize: Prélude et Danse Fuguée - World premiere recording! Available through the Gothic Catalog. 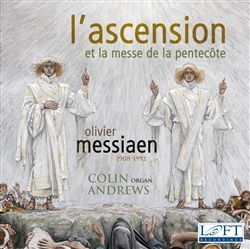 Olivier Messiaen’s French-Catholic mysticism is reflected in his unique musical vocabulary—it forms the basis of one of the most important organ repertoires of the twentieth century. His “Nativity Suite” is one of the most popular of his early organ works, offering musical meditations on the themes and characters of the Christmas story. Also included is the premiere recording of Lionel Rogg’s Hommage à Messiaen. 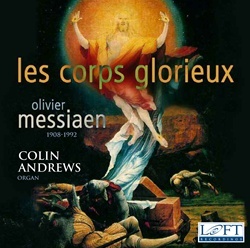 Acclaimed organist Colin Andrews presents his own musical homage for the centenary of Messiaen’s birth (2008). Each of the seven movements of this powerful work presents a musical and theological statement, expressed in Messiaen’s unique musical vocabulary. The haunting opening creates a mystical, mantra-like atmosphere that lays the path for an hour of extraordinarily compelling music. Colin Andrews, a large Fisk organ, and the acoustics of St. Paul’s Episcopal Church in Greenville, NC, are the ideal ensemble for Messiaen’s mystical masterpiece. 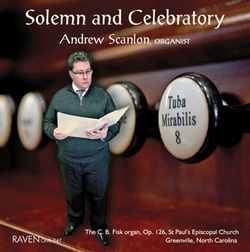 Colin Andrews, a large Fisk organ, and the acoustics of St. Paul’s Episcopal Church in Greenville, NC, are the ideal ensemble for Messiaen’s most popular organ work, the Ascension Suite, and his evocative Mass for Pentecost.